Born in Hong Kong in 1955, Bruce Fordyce’s family moved to Johannesburg when he was 13 years old. He completed his school career at Woodmead High School and subsequently attended the University of the Witwatersrand, where he obtained his Bachelor of Arts degree in 1977 and his Honours Bachelor of Arts degree in 1979. He was given an honorary doctorate from the University in 1997. In 1977, when Bruce Fordyce first ran the Comrades marathon, he placed 43rd out of 1,678 entries. He gradually "rose through the ranks" and went on to win the Comrades for an unprecedented eight consecutive years between 1981 and 1988, and won it again in 1990. No other runner in the history of the Comrades had ever achieved this feat before or since Fordyce. He also held the record time for the "up" (Durban to Pietermaritzburg) run and his record for the "down" (Pietermaritzburg to Durban) run of 5:24:07 (set in 1986), had stood for 21 years before finally being broken in 2007 by Russia's Leonid Shvetsov. Bruce Fordyce's first victory was particularly brave and notable. An outspoken critic of Apartheid, Fordyce and a number of other athletes decided to boycott the 1981 event when organisers announced that they would associate it with the 20th anniversary of the Republic of South Africa. Ultimately though, Fordyce ran, wearing a black armband to signal his protest. He destroyed the opposition, crossing the line in a sensational 5:37:28, nearly 10 minutes clear of second-placed Johnny Halberstadt. His protest attracted boos and even some rotten tomatoes from a largely white crowd. With Bruce Fordyce to the fore, the Comrades captured the imagination of the South African public. Race entries skyrocketed, and lining the road and cheering the runners on became a tradition on the public holiday when the race was held. The Comrades field, which had been just under 4 000 strong in 1980, grew to over 10,000 by the end of the decade, with Bruce Fordyce entrenched in the public's imagination. Apart from all his Comrades records, Fordyce is the world record holder over 50 miles - which he set during the 1983 London to Brighton ultramarathon – and he also holds the 50 mile record for the United States All Comers Race. In addition to having written two books about the Comrades Marathon, Bruce Fordyce, who was voted 64th in the "Top 100 Great South Africans", is also a sports columnist for various newspapers and magazines. He is also the Chief Executive Officer of the South African Sports Trust, an independent body established in 1995 to fund sports development in the country. Bruce Fordyce still partakes in the Comrades and other endurance events like the Duzi Marathon for charity. 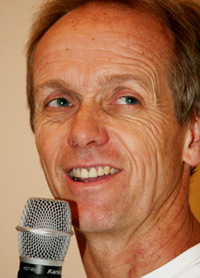 Bruce Fordyce is sought-after as a motivational speaker and has delivered talks to various corporations from most major South African industries, including the insurance industry, car companies, computer industry, accountants, pharmaceutical companies, estate agents, banks, furniture trade and the clothing industry. He delivers two light hearted, humorous, but inspirational messages to his audiences, one applying the principals of success in marathon running to everyday life, and the other in an interesting address entitled "Why should you want to leave South Africa"? Book Corporate Entertainment - We have South Africa`s TOP Artists. Hire a Comedian, Master of Ceremonies, Live Bands, Dance Acts, you can even Hire a Magician - We have the very BEST in Live Entertainment for your function or event.